Research confirms what members of Alcoholics Anonymous have known for almost 80 years. It is the importance of making amends. An article published in The Journal of Positive Psychology, and reported in Medical News Today, support the claim that it is easier to forgive ourselves for hurting another person if we first make amends. Psychology researchers, from Baylor University in Waco, TX, report the findings of two studies. One study involved 269 participants recalling previous offenses – such as romantic betrayals, physical injuries, gossip and rejection – they had committed in their lives. In the other study, 208 people were questioned about a hypothetical offense. ◾How much they saw self-forgiveness as morally appropriate. The people in the study who made the most amends reported feeling the most that self-forgiveness was morally permissible. This process of being able to self-forgive was also made easier if the participants had received forgiveness from the people they had wronged. While I agree it may be easier to forgive yourself if the other person forgives you, my experience is it’s not required. There is one individual in my life that I hurt over and over again in many ways. Nothing personally directed at the individual, they just happened to be in my life during a time that I was being self-centered and making a series of very bad decisions. 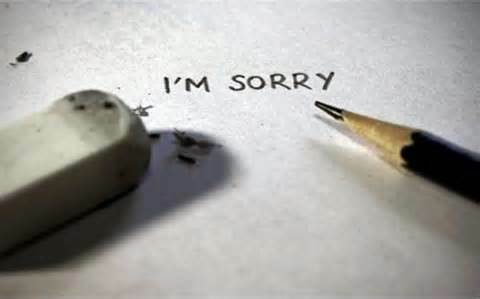 When I went to make amends I thought I was prepared for the worst. I was nowhere nearly prepared. My amends was met with fury, tears, screaming and being called every name in the book. Would it have been easier to forgive myself had I gotten a more positive reaction? Oh hell yes, but I still felt like a major weight had been lifted off my shoulders. This practice is what many in A.A. refer to keeping our side of the street clean. I can’t repair the damage I’ve done. It’s too late for that. All I can do is clean “my side of the street.” The best I could do was to make a verbal amends. The response I receive is beyond my control. I can’t force to be forgiven, all I can do is do the best I can. According to the article, the people who made the most amends reported feeling the most that self-forgiveness was morally permissible. However, there was a broad variation in the types of offense reported by the participants, so the second study was set up by the researchers to further test their hypotheses. This second study asked the participants about a hypothetical scenario in which they had to imagine failing to take the blame for an action that caused a friend’s firing. This study reported similar results to the first experiment, though one difference was that there was little effect from receiving someone else’s forgiveness on whether the participant forgave themselves or not. Overall, the research showed that the more serious the offense was, and the more guilty the perpetrator felt, the less likely they were to forgive themselves. But making amends could help the wrongdoers reduce their feelings of guilt. Carpenter stresses that the study’s main finding is not so much about receiving forgiveness as how our moral attitudes play a part in self-forgiveness. The idea is that the act of trying to do the right thing, almost a sort of penance, helps the situation feel more balanced and gives us moral permission to let go. We hypothesized that people would actually see it as less moral to forgive themselves unless they had sought to make amends first. In other words, we suspected that people actually are withholding self-forgiveness until they have had a chance to at least try to make things right. Given that moral attitudes toward self-forgiveness were one of the strongest predictors of self-forgiveness across both studies, our research suggests that the process of morally refusing or allowing ourselves to self-forgive is actually quite important in the self-forgiveness process. One other note I must make is, based on my experience, making amends to an individual is most rewarding if you believe the other individual was more harmful than you. In a previous relationship I was physically, verbally and mentally abused by an individual. Our relationship ended one evening as I watched him being driven away in the back of a squad car. He was in jail for three days and still refers to it as being my fault. He has no remorse. I had reached the point in my recovery that it was time for me to make my amends to him. Naturally I believed the situation should have been reversed, but I could only focus on the things I’d done. I met him at a coffee shop, we talked for thirty minutes and we ended with him telling me the things I did were no big deal. I did wait a few seconds for him to make his amends, but it never came. I walked away from our meeting feeling, not like a weight had been lifted, but the world had been lifted off my shoulders. I was surprised by my feelings. I do want to stress, you should not make an amends if doing so is going to injure them or others. And do not place yourself in a dangerous situation. Making an amends to a violent individual should not be taken lightly. Ahhh yes, making amends. If only all people of the world knew it as well as the AA/NA/12-step programs’ members. I’m a 12-stepper, but I do believe in making amends and have always felt like there was a burden lifted from me. In an abusive relationship I was in, I found myself really wanting to make amends, but knowing that it was nowhere near safe for me to do so. In that case, I wrote a letter and burned it in my fire pit. That was freeing, but still not enough. I don’t know what else to do, though, other than pray on it. Some times you have to be creative when making amends. For example, a donation to a woman’s shelter. Sometimes the only amends you can make is to yourself since it wouldn’t be safe to do otherwise. Prayer works.